I enjoyed your article on teaching the Pomeranian to come. My husband and I would like to get a dog, but don't know where to start. Here's our situation. We just lost our last dog, and are still sad about it. We think it would cheer us up to get a new puppy. We have no children at home and are in our 50s, so might want to consider a less-active breed. Can you help with suggestions on this? 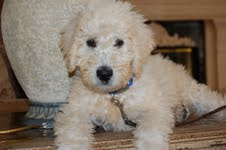 I will plan to get training for the puppy, but need more help on how to keep the puppy out of mischief. My last one got into everything, and was quite a chewer. We lost more than a few shoes, chair legs and other chewables to him. I have read on All Things Dog Blog that this could mean he needed more exercise. What ideas would you have on this, for a middle-aged owner? We do not own a treadmill, and are not bikers. We can walk a dog, and would like to try the dog park. Now that you’ve made your decision to adopt or purchase a new dog, I strongly advise you take your time in selecting the new family member. Never purchase or adopt on "impulse". You have already taken the first and most important step – analyzing your lifestyle. What role will he play in your life? Can you walk him twice a day for 30 to 45 minutes, or do you only have 10 to 15 minutes? Do you have a play area for him during the day such as a fenced yard, or do you have a patio or deck area? How much grooming do you want to do, or can you afford a monthly grooming bill? How does having hair all over the floors and furniture affect you? Do you have a swimming pool, access to a dog friendly lake, or a yard with a water hose? Are you going to take him with you on daily outings or will he guard your home? How much money do you want to spend on food each month? Will he need to get along with your grandchildren or neighbor’s children? Answer these questions honestly. (Need help establishing your criteria? See recommended reading list below.) Once you have your criteria, spend time researching dog breeds. Go to the library or local book store, or research breeds online at AKC.org. You should avoid high energy terriers, working, herding, hunting, or toy breeds since you and your dog’s activity levels should match. If you like smaller dogs, the Pug, English Toy Spaniel, or Boston Terrier are options, as well as the Pekingese, if you don’t mind the grooming involved. These are lower energy, generally even tempered dogs. Medium to large breeds you might consider include the Bassett Hound and English Bulldog. The Golden Retriever would do well providing you are consistent with daily walks and give him at least an hour of mental stimulation daily. If you like even larger dogs, the Mastiff, Irish Wolfhound and Great Dane are excellent choices that love laying around with you. Because of their size, obedience training is a must. Click here for more TCDOA dog selection suggestions. After finding a few dogs that might fit into your lifestyle, choose one based on your criteria. Contact breeders, rescue organizations and/or local animal shelters. Avoid puppy stores. All dogs need mental challenges to reduce destructive behavior caused by boredom or lack of exercise. Try treat dispensing toys, and spend time training them every day. Visit Busy Bones and Other Boredom Busters for more suggestions. Taking your dog to a dog park can be fun, but only if you and your dog are ready. Before you go, visit Guidelines for First Time Dog Park Visits. Welcome aboard, Judy. Great post! I really love the questions that you posted to distinguish exactly what you would be able getting a new loved one. The issue that I have is trying to convince my boyfriend that small dogs are not a problem. He even made the comment that small dogs are not masculine enough and that is why he refuses to have a smaller dog. I think that small dogs are better for our lifestyle because the training involved is not as rigorous as it were if we were going to get a big dog. We live in a town house and I do not believe that it is fair to have a large dog like a German Shepard because there is not the space to have such a large dog. I would love help in order to convince him that at this point in our life a smaller breed makes much more sense. I would also love if I could get suggestions of what breeds would be more "masculine". I have always wanted a Pug because I believe that they are well rounded dogs and I do not consider them the smallest breed but my boyfriend things that they are not a good dog to have. Should I present some research to him suggesting that Pugs are in fact great dogs? Am I being inconsiderate if I do not keep the option open of getting a larger dog? Is there a website that I can go to in order to find the perfect dog for the both of us? @Anonymous: Of course, in a perfect world, most any dog could live in a small townhouse. However, tight quarters and a large, energetic, dog will mean much more exercise and training time required. Both of you must ask yourselves if this is realistic, as without these components your efforts to bring a larger dog home may end in a very sad way. On the other hand, a number of breeds can be considered more macho and still live in smaller bodies: Beagle, French Bulldog, Bulldog, Basset Hound, and many more. Best wishes in your decision.